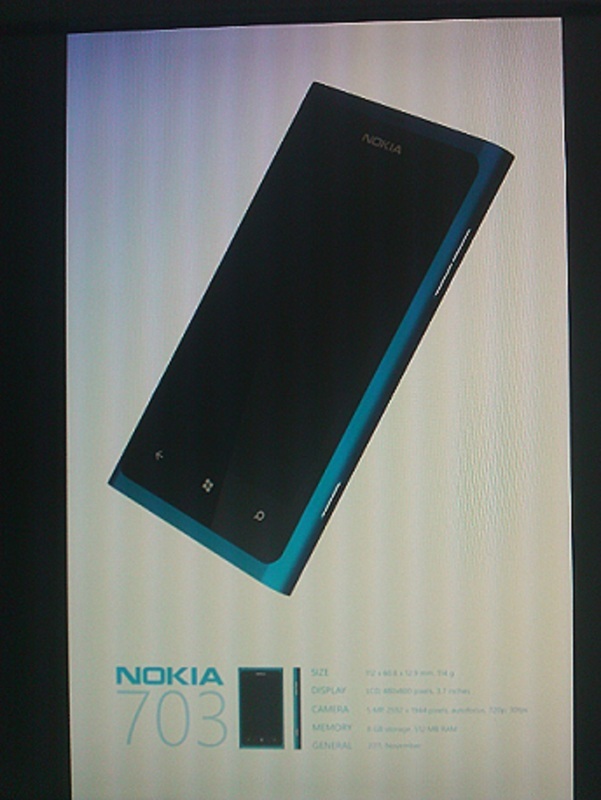 Yesterday we heard about a possibly Nokia 703 Windows Phone handset. Whilst there were some concerns by our readers that the 703 in this instance could just be a modified device UID, WMPU was sent an image of possibly that same device, which looks like the Sea-Ray with camera and front buttons (that in turn looks like the N9). Unlike the expected 3.9″ screen of SeaRay (thus to be the same as N9) this has a 3.7″ screen (unless, SeaRay never had an identical screen size). 8GB Storage, and 512MB RAM, on par with the other 7XX in Nokia’s line up. No lock button on right side (as with SeaRay) perhaps it is on the left. Cheers Just Visiting and Anastasios-Antonios for the tip! Btw I didn’t get around to posting about this yesterday when you folks tipped it and probably won’t. But here’s the link to share anyway. This suggests confirmation of the N9 design in SeaRay and possibly more.